Following on from the getting started with Git tutorial, this article will focus on adding, committing and pushing with Git. Firstly, take a look at the image below. Don’t worry if you do not understand everything in this image. For now, focus on the different ‘areas’. If you have initialised a new Git repository, it will have nothing within it. Git is notifying you that in your working directory area, there is a untracked file. Git will also tell you that in order to add the file into the staging area, we have to use the ‘git add’ command. Will stage all of the untracked files. Running a git status afterwards shows that Git now recognises the staged file and states the changes are now ready to be committed. $ git commit -m "Our first commit message"
Many companies use third party companies to host their source code. Remote repositories are set up which allow users to manage many codebases. 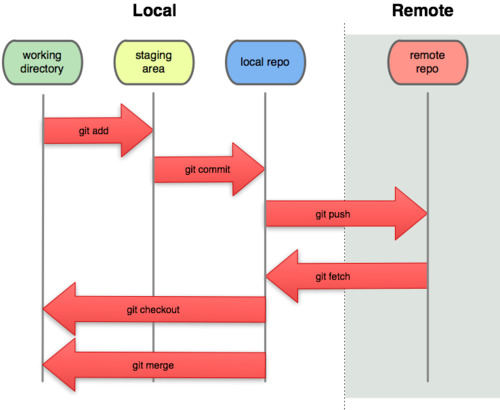 The ‘git push’ command will push the changes made to your local repositories to the remote repositories.